Continuing the sprouting fun, today we’re covering how to sprout using a hemp sprouting bag. 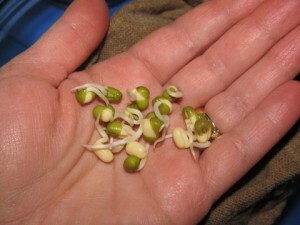 And we’re sprouting the classic bean sprout–the mung bean. 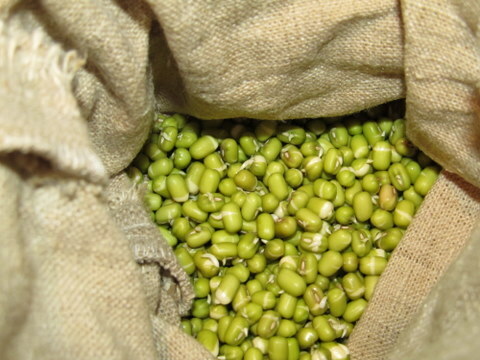 You can sprout any type of sprout you’d like in the hemp sprouting bag, but it really works best for beans and grains and not so well for leafy sprouts like alfalfa. 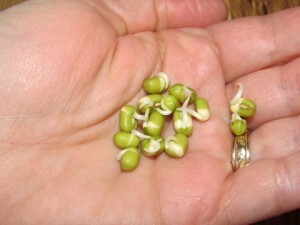 Remember the “greening” step in sprouting leafy sprouts? Well, it’s hard to get sunshine to all the sprouts in the bag to green them up. But grains and beans don’t have to have the greening step, so they sprout in the sprout bag just perfect. I thought maybe I could make a sprout bag out of some other fabric, and possibly could. 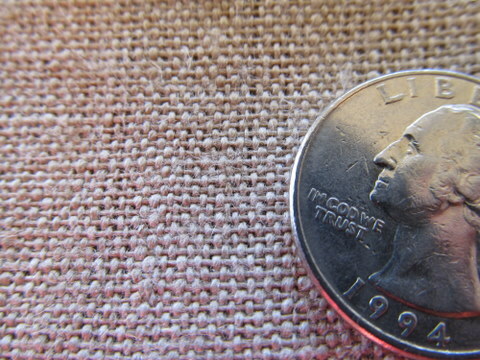 You’d want your fabric to be thick so it didn’t dry out too quickly, with a semi-loose weave so the seeds don’t fall out but they do get air circulation. Maybe a heavy linen would work. I’ll have to try it sometime. 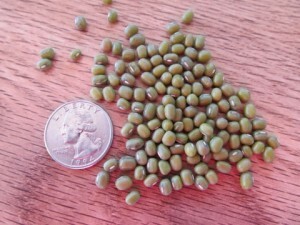 And here are the mung beans in case you need to know what you are looking for. They’re small green beans. Smaller than most soup beans. Okay, now you know what we’re using today, are you ready to start sprouting? Step 1: Soak your seeds. This is the same as with any method of sprouting. 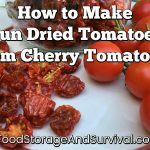 Put them in some water–you can use a jar, cup, bowl, or whatever works for you. I usually let them soak 6-8 hours or overnight. 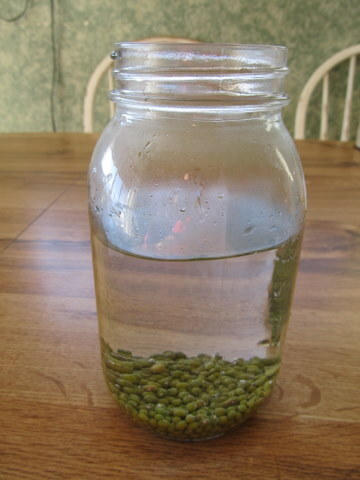 Soaking mung beans, aren't they lovely? Step 2: Prep your bag. Because this was the first time I was using my sprout bag, the instructions said to boil it inside out for 5 minutes, so that’s what I did. 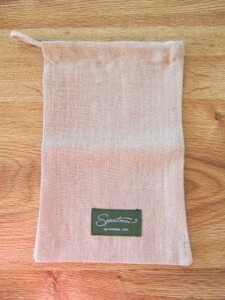 It probably gets all the sewing factory germs off the bag so it’s nice and clean for your sprouts to grow in. 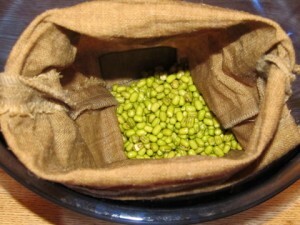 Step 3: Put your seeds in the wet bag. Just go ahead and pour the whole seed/water mix into the bag over the sink. 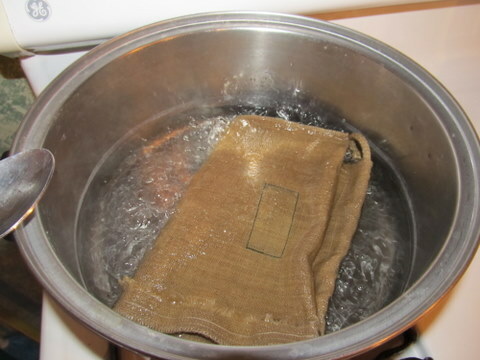 The soak water will drain out of the bag and leave your seeds. Step 4: Rinse and drain. I like to do one rinse and drain cycle right away just to make sure the seeds get a nice fresh start to sprout. One of the benefits of the sprout bag is that it drains really easily and you could just hang it somewhere over your sink or over a bowl and let it keep on draining. Step 5: Close the bag and put it somewhere. I actually left this one out on the counter in a bowl to hold any excess dripping. 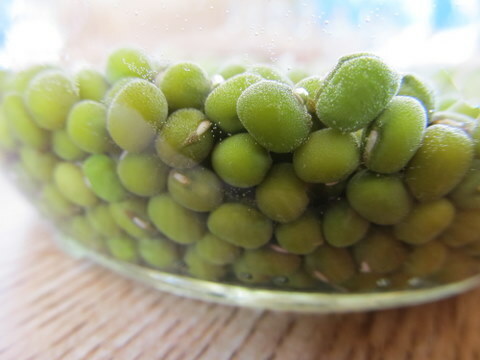 If you use a bowl, make sure there isn’t water puddling at the bottom that your seeds will be sitting in. You can also hang it somewhere to let the seeds sprout. Step 6: Rinse and drain 2-3 times per day. The instructions for the bag say that to rinse you should immerse the bag in water for one minute then let it drain. I just poured water in my catch bowl until the bag was covered and let it sit and then dumped it out and let the bag drain. I did this twice a day and the bag would just be starting to dry out by the time I got to rinsing it. That is in super dry Utah winter weather. Y’all in the humid parts of the country probably wouldn’t have your bag dry out at all. This is one of the reasons they use hemp fibers because the natural oils in the fibers help retain the moisture. Maybe if you had some other fabric you’d need to rinse more often to keep it moist. I don’t know. Step 7: Check on your sprouts’ progress at each rinsing. If you don’t know how long you like your sprouts, give them a taste at each rinsing. I like my bean sprouts kind of short while they’re still nutty and not “green” tasting. I like the beans about 24 hours in the sprouter. Just eat them whole. At the 48 hour mark they are tasting “green” and a lot like bean sprouts from the store. I remember I am not a huge fan of bean sprouts, so we just ate them at the 48 hour mark. You could continue to let them get longer and they’d all slip the green coating and look more like the bean sprouts that you’ve seen at the store or at restaurants. Step 8: Eat and store. Eat your yummy sprouts, and if there are any left over, you can store them right in the bag in your refrigerator. You don’t want to put them in with a really wet bag, so make sure you put the sprouts in for storage before rinsing them that last time. Step 9: Clean the bag. To clean your bag you’ll just turn it inside out and rinse with hot water. 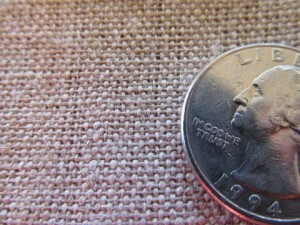 No soap or detergent as this will remove the natural oils in the fabric. Lay it out and let it dry before putting it away. I’ll admit I was a bit skeptical about sprouting in a bag, however, after trying it out, I really liked it. You can sprout quite a few sprouts in there if you fill the bag up and it was easy. The bag kept the humidity level for the sprouts just perfect. 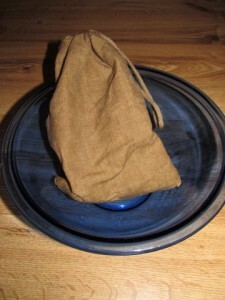 An added benefit to the sprout bag is that it is easily portable if you’re planning a trip or a bug out and want to take some sprouting seeds along with you. Sprouting Mug Beans is versatile and nutritious to say the least. I look at them, they are very fun to grow. Thank u so much for posting this. Very cool procedure… well explained. I actually host a weekly gardening link up every Friday on my blog. I’d love for you to drop by and join in.